Ecologists help people understand the connection between living things and their environment. There are many fields in ecology, including animal behavior, population biology, conservation biology. and marine ecology. Within these fields there are many amazing careers to pursue on land and sea. Ecologists must be really curious about how life works on earth. 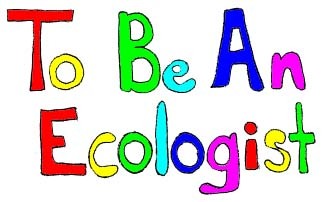 See how some curious kids became ecologists. Ecoinformatics Specialists use computers and other advanced technologies to manage the vast amounts of information that are gathered from scientific observation. Ecoinformatics is a pretty new field in ecology, and there are a lot of opportunities to apply computer skills like programming to help other ecologists and land managers organize their information and make sense of it. Ecotoxicologists study the effects of chemicals or other stresses on plants and animals. Their research helps policy makers to set environmental standards so that humans do not release harmful chemicals into the environment. Ecotoxicologists usually have training in chemistry and physiology. Environmental Consultants look at the ecological impacts of development or conservation. They also recommend different methods to solve ecological problems. Environmental consultants may spend a lot of time outside, as well as writing reports and talking to policy makers, and they can work on many different types of projects. Environmental Economists try to translate environmental issues into dollars and cents. It is pretty new for lawmakers to have to compare environmental costs to business costs when they are making decisions about conservation. Environmental economists can help to answer questions such as: how much is this land worth if we do not develop it? Environmental Educators teach students and adults about nature, new discoveries, and the ecological problems we are facing today. Environmental Lawyers specialize in legal issues that concern environmental problems, such as helping to find compromises between people who want land conserved for nature and those who would like to develop land for businesses. The Environmental Defense Center in Santa Barbara is an example of an environmental law firm. Environmental lawyers have advanced degrees in law and sometimes also in natural sciences or business. Research Assistants collect and analyze results from field and lab studies. Generally college and high school students are encouraged to explore working as research assistants. Here in Santa Barbara, and at other universities, there is a large demand for research assistants and it’s a good opportunity for students to find out whether or not they like research! Research Scientists usually work in groups and come up with new questions, ideas and techniques to solve ecological problems facing the world today. These are the people that need research assistants to help them with their research. Professors teach at colleges, universities, and sometimes high schools. They also do research, and guide graduate and undergraduate students. Program Managers find ways to use information from research assistants, research scientists, and professors to manage environmental resources and help policy makers understand the ecological problems we are facing today. Science Writers write about scientific discoveries, issues, and problems. They write for magazines, newspapers, books and the web. Some science writers specialize in writing about the environment.